Pitch 5 hosted all 3 matches this week and first up was MarriedMan against Hibernians. Despite playing their 2nd game in 24 hours, MarriedMan swept into a 2-0 lead with goals Izzudin and Hairil. However, 2 goals from the league’s top goal scorer Connor and a thumping finish from Derrick Buckley meant that Hibs had turned the tables to lead 3-2. The second saw Fahad put Hibs 4-2 up before Hairil turned his marker to finish coolly to keep Marriedman in the game. Crucially, goals from Gary Corner and another for Buckley meant Hibs were now 6-3 ahead. Megat gave MarriedMan hope with his goal but 2 late strikes from Billie ensured Hibs went on to claim the 8-4 victory. Next up was Balotelitubbies against Bone Soup in the race for 2nd place. Goals from Matt Doyle and David Calvert put the Tubbies in front before Jason scored to keep Bone Soup in the game. 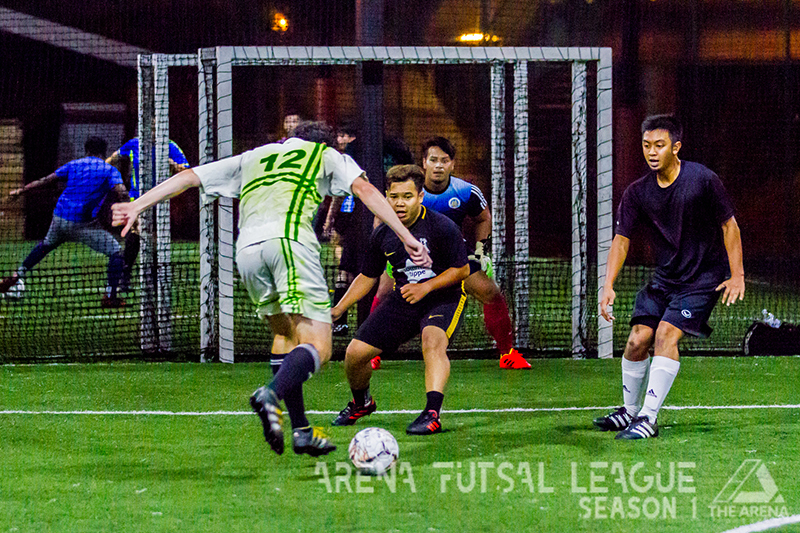 Andrew Tan then scored to bring Bone Soup level and soon after, Nicholas Khoo put them ahead! A stunned Tubbies side managed to compose themselves and draw level thanks to Chris Kaey before a last-minute winner from Mat Doyle gave Tubbies the 4-3 win! The final match of Matchday 13 featured the Russla’s Hustlers vs Red Indians. Two goals from Ramesh and another from Syahir saw Red Indians lead 3-0 as Russla’s struggled to get to grips with the match. Amazingly, they rallied as Viktor Walz scored a double, Seb Worthington grabbed a hat-trick and a goal for James Lord saw Russla’s led 6-3 before Ganesh scored for Red Indians for a 6-4 Russla’s lead at half-time. The second half was a more one-sided affair as goals from Sam Ladbury, Viktor, Seb and James gave the Hustlers a 10-4 lead before Ramesh scored a consolation for the Red Indians as the Hustlers won 10-5.